The Voivodeship Administrative Court in its judgment of 7 May 2010 case file VI SA/Wa 33/10 ruled that the illustration of the industrial design shall consist in particular of drawings, photographs or samples of a textile fabric. The description describing the illustration of the industrial design should present the design in a manner clear and detailed enough to enable the design to be reproduced on the basis of the illustration in any form indicated in the application. In particular, the description shall contain the definition of the industrial design and indicate what it is intended for, determine the figures of the illustration or indicate numbers of samples, include a numbered list of the forms of the industrial design where the application contains such forms, and finally designate those features of appearance, which distinguish the filed design from other known designs and enable its identification. Therefore, that abstract and claims are not required in the application for industrial design. However, some applicants continues to file design applications with protection claims included, which is the remnant and a habit, pursuant to old provisions on ornamental designs. In the assessment of the design application, the Polish Patent Office should, as indicated by the Voivodeship Administrative Court in its judgment of 11 August 2009 case file VI SA/Wa 1088/08, and according to the provisions of Article 153 of the PBAC, include analysis of the documentation referred to in Article 107(2) of the IPL. (ii) which must necessarily be reproduced in their exact form and dimensions in order to permit the product to be mechanically connected to, or to interact with, another product. 2. The provision of paragraph (1) shall be without prejudice to the registration of an industrial design serving the purpose of allowing multiple assembly or connection of mutually interchangeable products within a modular system. The Court held that the abovementioned practice exercised by applicants and the PPO with regard to accepting applications with protection claims and the registration process, does not exempt the PPO from the duty to examine industrial design applications according to Article 107(2) of the IPL. 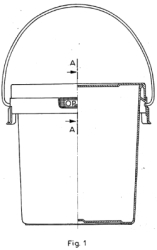 This judgment concerned the industrial design “Wiadro” (in English: Bucket) Rp-1077. This judgment is not yet final. A cassation complaint may be filed to the Supreme Administrative Court. See also “Polish regulations on industrial designs” and “Polish case law on industrial designs“. Categories: Art. 104 IPL | Art. 107 IPL | industrial designs | invalidation of a right in registration | novelty of an industrial design | Polish Act on Industrial Property Law | Voivodeship Administrative Court.